Click here to see my walkthrough. IDAC has a number of room escape games in the App Store, and this is one of their better-looking ones. However, it suffers from poor game mechanics. While this game utilizes your usual room escape controls, they can sometimes be a bit off, resulting in many repeat attempts to do something seemingly simple. Most of the puzzles are fairly straightforward in concept, but the game mechanics make them seem more complicated than they really are. The game is very linear, to a fault. Even if you find parts of a puzzle and have an idea what you should be doing with it, you won’t be able to do so until certain other steps are taken. This could lead you to think that you’re wrong about a puzzle solution, when it merely means that you need to come back to it later. Sometimes you need to look over every inch of an item before it will allow you to move it. And some clues are off, which could make one think their game is bugged. This makes the game unnecessarily frustrating, and may lead some players to quit early on. But it’s still a decent game with some interesting puzzles, worth playing if you can pick it up for free. There really isn’t much story here. You decided to check out an eccentric man’s “strange house” and got locked inside. Now you need to use your surroundings to escape. The 3D graphics are a huge step up from IDAC’s usual simple 2D drawings. However, like all their games, it only utilizes half the iPhone screen, so it’s not as impressive as it could be. Instead of using the whole screen, the top part is your inventory, and the bottom has ads. You can navigate the house, but you see the four corners, as opposed to the usual four walls. This is an interesting variation from other room escape games. Overall, the graphics are pretty impressive, albeit a bit stiff. There’s no music in the game, and the rest of the sound effects are mainly the typewriter sounds coming from the text and a sparkly noise to announce you found an object. This makes the game feel a bit incomplete, and makes it hard to get fully immersed. There’s no reason to play this game again once you escape. In fact, you’ll probably be so glad to finally be out of there, that you may delete it right away. 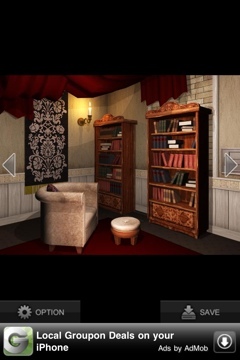 This is a challenging little room escape game that’s worth playing if you get it for free. Keep in mind that if you pay for it, it’s fairly short and you likely won’t play it more than once. The linear gameplay and sometimes-awkward controls may lead to gamebreaking frustration, but trust your instincts to escape the Strange House. If you’re looking for more free room escape games, check out Diamond Penthouse Escape 2, Escape Game: “An Uninspired Man”, Escape Game: “An Odd Game” and these other room escape games. Previous PostAntrim Escape 3: Game Review: Best iPhone room escape series returns with its highly-anticipated third installment. Next PostRoomBreak: Escape Now!! : Game Review: A flawed diamond. If you’re looking for a walkthrough, feel free to leave any questions here and I’ll do my best to help! Once you have both hands, just combine them together. One of the icons should change to show both of them. Then you can attach them to the clock. I have both hands of the clock but can not combine them:( how should I do that? Try opening one one then using the other on it. It might have to be specifically one or the other that goes first, so try it both ways. Once they’re combined in your bag, you can put them on the clock. Doublr tap on the long hand , it should open. Than click the little hand and connect it to the long hand. I can’t figure out the phone and where to find the symbols to use the code book to translate. Clock hands won’t connect together? Ok, so you double tap one of the hands and then tap the other hand once, then tap on the detail screen, if you can’t get it if you click on the options button, then you click on how to play then click through. I have both clock hands and they just keep saying they won’t stay. I have tried to combine them but they won’t do anything like that. PLEASE help me!! How to get the hose ? Hi I have 2 out of the 3 monkeys. Ie the monkeybfron the statue andbthebone fron the clock. I need help with the 3rd monkey. In the upstairs bathroom there is a puzzle in the sink. I know how to do it I think but it won’t let me fill the tank that’s on top of the box. That can be a frustrating puzzle. You need to get 4dl into one beaker and then pour it on the scale. If you need more help than that, let me know. How do u pick up the beaker to pour in tank? I have everything in place bar a hose, metal tongs and a empty space on the bottom row which indicates I need to find something else. Please help…. Did you turn the water on? It won’t let me? Iv tried both bath and sink?? Oh, I thought you said you had the hose in place. The hose can’t be attached until the very end, after you find the clue that tells you (indirectly) what to do with it. Did you find all three monkeys? hey.. i have placed 3 monkeys acc to the instruction but still nothing has happend.. please tell me what to do..
No sorry. Iv got everything in place, but still have the hose and metal tongues. The last thing I did was place the monkeys, but can’t seem to do anything else? If you placed the monkeys in order, something should have appeared in the square on the door next to them. That’s actually one of the places I was talking about where the clue is horribly off. Try switching around the order of the monkeys until something changes. I tried everyhing with the monkeys and the hose and nothing would change or happen so i deleated the game very upsetting. when i first put the monkeys in place it said something happened i looked everywhere and even on the door still nothing. When the monkeys are in the right position, a keypad should open up on the brown door next to them. Hmm doubt it, but keep in mind that the order written on the door is not correct. So you need to rearrange them a bit to get it to work. Not sure why it would tell you it worked and then do nothing. Let me know if you have the same problem again. Symmetry is the clue here. You need to take those four numbers to the keypad and draw a line of symmetry down the keypad. Then you need to treat it like a mirror and type in the mirror image of the numbers you found. is it possible to give me an exable??? ?or explain it more??? For example, if you were given the number 4, you would type in 6. That’s how the game interprets symmetry. It’s not very intuitive, I agree. But if you draw a line down the middle of the keyboard and work it out like that (a mirror image), you should be able to figure out the code. I am messing also the 3 monkey !! Do you have the first clock hand? If so, take a closer look at it. Try working out the code again. If you have the right answer, it will work on the phone. I found 2 of the 3 monkeys and I need hint on the 3rd one. I also need hint on the hour hand of the small clock. I have opened the globe, the statue and the water tank in the basin. I have also used the phone and the 4 pics. From the msg posted, think I missing hr hand, monkey and hose. Thanks. How do u get the eye from snakes mouth? You need to solve the puzzle with the three statues. Zoom on every detail on the table and then you should be able to move them. Thx! Got the last monkey and now is the hose and sthg else. 2 more empty spaces. Drop me a hint when you are back here. Meanwhile I will continue searching. Thx. You don’t have the hose yet? Did you check all the cabinets? ;). And place the monkeys in their slots — the order the game gives could be wrong. Move them around a bit until something happens. The key pad appears after I shifted the monkeys around. The only place that i havent open seems to be the cabinet below the phone. Must have missed something. Hint? Are you unable to open that cabinet? The hose is in there. Can’t open that cabinet. I try again. Oh I forgot! You need to use the tongs on it! I tried many times. It says: it bent and won’t open. You tried the tongs on the cabinet and it wouldn’t work? Same problem. Tongs not working on the cabinet below the phone upstairs. Ok, I had to keep double tapping the tongs and the cabinets it kept saying bam bam the tongs hit it but it wouldn’t open after like 3-4 times it finally opened. Can anyone reveal the freaking code???????????!!!?!!!!!! Did you get the numbers off the marbles yet? I can’t figure out the phone and where to find the symbols to translate with the code in the book. Escaped. Thx. The game play is a bit complicated for simple game like this. The last code is kind of stupid too. The graphics is great though. Will try others. See ya ard. Found the last one. Hopefully I can unstick it. Thanks! I am now stuck. I have the two map pieces, the first 2 monkeys and and and and…. I have no idea what I am supposed to do to progress. I get that I need the monkey and to use the telephone, and to check the marbles, and the clocks blah blah blah… But I have no idea where I am supposed to go or do next. A hint perhaps?? Check the books downstairs to find the first code for the phone. where is the monkey that cant speak? If I remember correctly, that’s the one in the upstairs clock. i still cannot find it. is it in that statue? how do you open that door on the bottom of it? Oh you didn’t get the one from the statue yet? You need to put both glass eyes in and the panel will open. yes, i feel like im missing something. i got 2 of the monkeys, now like im stuck vie looked everywhere i do not know what the next step is. Do you have either of the glass eyes yet? nvm i got it thanks! You mean for the door keypad? lol wow thats embarrassing. thank you. Haha no problem. It’s a confusing one! I’ve got the final code and tried all combinations but still not cracked it what am I Doin wrong ? Have you tried drawing a line of symmetry down the middle of the keyboard, then using the mirror image of the numbers you got off the beads? If that still doesn’t help, let me know. Hi, the hose is one of the annoying parts of the game. You get it much earlier than you can use it. You can’t use it until the very end. For the first clock hand, look in the books downstairs for a number that could work on the phone. I also want to say thank you. this one was really frustrating. ok it will not let me put the hose on, and I am still holding the monkeys. should i place the monkeys first or something else with hose? How do you get the clock hands? I’ve only got two monkeys. Look at the right bookcase for a book that has a three-digit number. Use that number on the phone to get the first hand. Then inspect the second hand carefully. I can’t get the second hand off. i already tried with the tongs… can you help me? If you got the first hand off already, zoom in on it a few times to see the code for the 2nd one. Hi, I miss out on the hose only. Where can I find it? I tried looking but no ava. Hi! Make sure you zoom in on each animal and each label individually. Then zoom in on the carving on the table. After that, you should be able to move them around. I need the eyeball in the snakes mouth, but I’m not sure how to get it. Like i know you need to change the order of the animals but I’m not sure how to uhm yeah, move them.